Sequels are funny things. They’re always viewed by the cinema going audience with more than a dash of cynicism: the rule goes that they are, by their nature, a lesson in the law of diminishing returns. Of course there are surprises amongst the dross: Aliens, Star Trek II – The Wrath of Khan and The Empire Strikes Back, for example. All managed to buck the trend and prove that by taking the original concept, and spinning it off in a wholly new direction, away from its progenitor, a sequel can be just as good, if not better, than some stale rehash of glory days long past. It is with this in mind that David Twohy, The Chronicles of Riddick’s director / writer (and writer of the original film), must have tackled the sequel to his sleeper hit Pitch Black. 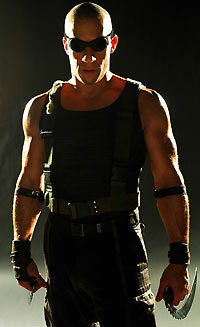 Would he pit his anti-hero Riddick (and the other survivors from the first movie) against some new monsters, and rehash the winning formula, or go somewhere else with the story? The film is set several years after the original. We find Riddick (Vin Diesel) still on the run, after escaping the nameless planet that was home to the nasty nocturnal beasties. Bounty hunters continue to pursue him around the universe, usually getting bumped off by Riddick for their sins. Eventually Riddick escapes to the planet Helion Prime, and finds himself in the middle of a battle between Helion Prime’s citizens and the dreaded army of the Necromongers, lead by The Lord Marshal (Colm Feore) and his scheming wife Dame Vaako (Thandie Newton), who plan to “kill or convert” everyone on the planet so they might get to The Underverse. It is here that Riddick, with the help of Aereon (Judi Dench), discovers that he has a destiny to fulfill: to save the universe from the Necromongers. As a change in direction from the original The Chronicles of Riddick is certainly “out there”, with Twohy suddenly giving the Pitch Black universe a much larger scope, a more epic feel and Diesel’s one-note psychopathic character some much-needed depth and purpose. The Chronicles of Riddick is definitely attempting to step out from the B-movie shadows from which it originated; the design work on the Necromongers alone is a Goth’s dream, with its huge gothic towers, all dark steel and ornate carving. The architecture is certainly impressive enough, giving the movie a Dune-lite feel. The story is equally huge in scope, and demonstrates a real ambition to move away from the first film. But, alas, beyond the high aspirations, the story is standard fantasy / science-fiction fare: a hero finds redemption by changing his selfish ways and fighting for the good of all. Fans of the original may actually feel that this story is too fantasy driven, after Pitch Black’s more Alien-style gritty “Space is just another place to work” science-fiction feel. By comparison The Chronicles of Riddick feels like watching Dune after watching all the self same characters in Dark Star. The acting is, at best, variable, Vin Diesel gives his usual “I gargle with gravel and sandpaper” growling leading man as Riddick. 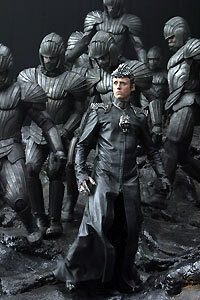 Colm Feore is woeful as the lead villain, and certainly doesn’t give the impression of a man who has conquered planet after planet: he’s more like a really angry manager at MacDonald’s and you are never in any doubt as to who is going to win in the inevitable showdown between him and Riddick. One question is certain to plague audiences: What possessed Dame Judi Dench to appear in this? I guess we’ll never know, but it’s clear that she is really phoning in her performance, but even then she has more gravitas than the rest of the cast put together. As with all sequels, comparisons with the original are inevitable, but, as mentioned before, Chronicles is so far removed from Pitch Black that it is almost impossible to reconcile them. The effects work has markedly improved. This is mainly demonstrated with the Necromongers, but it isn’t faultless. Check out the scenes with the prison dog creatures, for a perfect example of where it fails. The writing still remains firmly in the corny B-Movie league: “It’s been a long time since I smelt beautiful”, Riddick growls at one point, as Thandie Newton glides past. The action has also upped the ante from the original, with Riddick managing to kill wave after wave of faceless bad guys in new and novel ways, but, even so, some sequences still manage to make even the most brainless viewer balk. Watch as Riddick and co outrun the rotation of the planet they’re trapped on, where the sunlight is so strong it melts the surface, and people can only survive on the dark side. The direction is very workmanlike; the editing simply does the job; and the cinematography does its best to take in the fantastic design work, and keep the viewer interested, but it’s not enough. By the film’s finale, when the slightly surprising setup for a third installment is clearly laid out, you’ll find it hard to even care. The Chronicles of Riddick is, for all its grandeur, its epic scope, its fantasy trappings and huge set pieces, dull. The action is so relentless that the reasoning behind it all is soon lost, and all you’re left with is simply the questions “Who’s he going to kill next?” and “How?” Considering that Twohy and co have obviously tried very hard to work on getting Chronicles away from the B-Movie label, that is a surprisingly B-Movie / straight to video attitude to inspire in an audience.